2.2What do I like best about school? 7.1Have you ever been to an English corner? 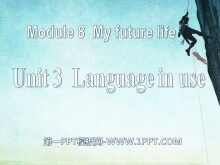 《Language in use》My future life PPT课件2 Read these sentences and think about their structures. I know that you will be better at maths. These roses are to thank three groups of people for the three most impo..
《Language in use》My future life PPT课件 warming up How many days are left before you leave school? Do you feel nervous every day? What time do you go to bed every night? 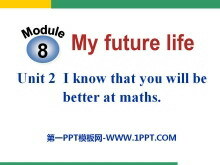 Do you have time to do exercise except..
《I know that you will be better at maths》My future life PPT课件3 Free talk Who do you want to thank on school-leaversparty? Why? A friend in need is a friend indeed. 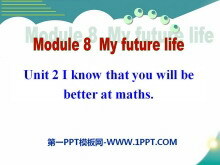 the importance of share go on to continue ..
《I know that you will be better at maths》My future life PPT课件2 Warming up How soon will you leave school? Will you have a school-leaversparty? Where will you hold the school-leaversparty? 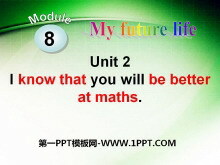 How will you decor..
《I know that you will be better at maths》My future life PPT课件 There is something you must do before graduating. 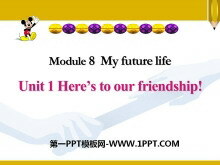 Go and bid farewell to each of your classmates because maybe it is the last time you can see t..
《Here's to our friendship》My future life PPT课件3 Warming up How will you feel at the school-leavers party? What are you going to show for your classmates? 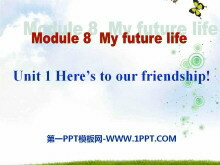 Will you wear beautiful clothes to take part in the ..
《Here's to our friendship》My future life PPT课件2 Words and expressions handbag n. (女用)手提包 beat v. 节拍，拍子 pardon int. 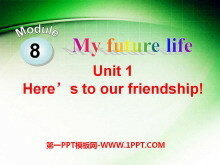 对不起，请原谅 intend n.水池，游泳池 fetch (去)取来，拿来 pancake 薄烤饼； 薄..
《Here's to our friendship》My future life PPT课件 Free talk If you have a school leavers party what is your feeling and what will you do for the party? Will you sing a song? 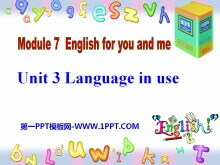 Enjoy a song Shining Friends A litt..
《Language in use》English for you and me PPT课件2 Language practice Its also the subject that Im best at although my spoken English is not that good. I can speak English with you whenever we meet. 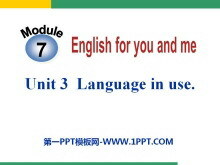 As China con..
《Language in use》English for you and me PPT课件 Read these sentences and analyze their structure. Its also the subject that Im best at although my spoken English is not that good. 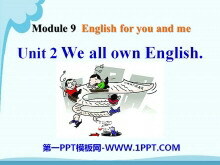 I can speak English with you..
《We all own English》English for you and me PPT课件2 Revision Translate the phrases and sentences. 1.足够好 __________ 2.最擅长于 __________ 3.太多努力_____________ 4.开始 ____________ 5.取得进步 ____________ ..
《We all own English》English for you and me PPT课件 Review Words and expressions 单词回顾 学生早读时已预习过本单元单词，可利用几分钟时间带学生快速回顾温习。对单词的熟练度越高，阅读的速率也越高。 Words and e..